The volume of the digital universe is expected to double every two years. But how much of that data has business value? The Global Databerg Report found that, on average, 85% of all stored data is either dark – digital information not in use – or redundant, obsolete, or trivial. In today’s competitive business climate, the key is to identify the data that is useful so you can make informed decisions based on accurate, up-to-date information. 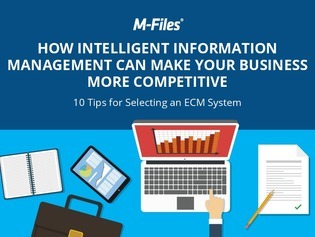 Download this ECM guide to uncover the benefits of an intelligent ECM system, and explore 10 expert tips for selecting your new system.